Hi there. Nice to see you're still with us. Icethetics is not dead. I really want to apologize for the total lack of updates to the site lately. Frankly, there hasn't been an awful lot going on and I've been extremely busy working on other things. I'm hoping to be able to devote more of my time back to Icethetics and improve things very soon. I'm working with an artist right now to set up the beginnings of the Logo & Uniform History section of the site. I hope to be able to launch that soon and then get back into the swing of things. New tournaments, Featured Artist pages, that blasted third jersey ranking I've been promising for months, and so on. Quick bit of news. 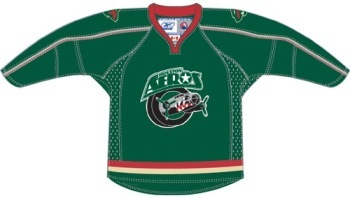 A reader sent in this image of the Houston Aeros' new green third jersey. He wonders whether we might see the Wild in something similar next season. It's certainly possible. From what we've heard, they have been talking about adding a green sweater to the collection. By the way, if you plan on watching the Winter Classic tomorrow, don't forget about the Lost Logo Challenge. Sorry, Chris, but I've gotta correct an AHL post again. That Aeros jersey is neither new nor a third jersey, It's their away jersey, as it has been since 2005-06 (only the cut has changed to Edge). Hope you aren't insulted by this, but I think you should do some more research about AHL-realted things before you post them. You seem to frequently get things incorrect when you post about the AHL. Fair enough! No, I'm not insulted. In fact I'm not even surprised. While the jersey may neither be new nor a third, my point still stands in suggesting it would make a nice addition to the Wild's set. Thanks for checking my facts. At least somebody here pays attention to what's going on in the AHL. Anyone, insterested in being an AHL correspondent? ECHL correspondent? If so, email me (don't leave a comment or I may not see it). Let me know why you're qualified to report on the minor leagues and what sort of writing/blogging experience you have. Obviously, I could use some new team members to keep Icethetics fresh! Avs To Don Third Next Year?